This is a view of the southern Bohemia resort and touristic town of Cesky Krumlov, where I spent a few hours photographing. By the way, “Cesky” means a “bend in the river” in Czech. Many old towns in the Czech Republic are named beginning with Cesky, because these oxbow bends in a river lent themselves to natural fortification back in the days when defense against literal robber barons was required. 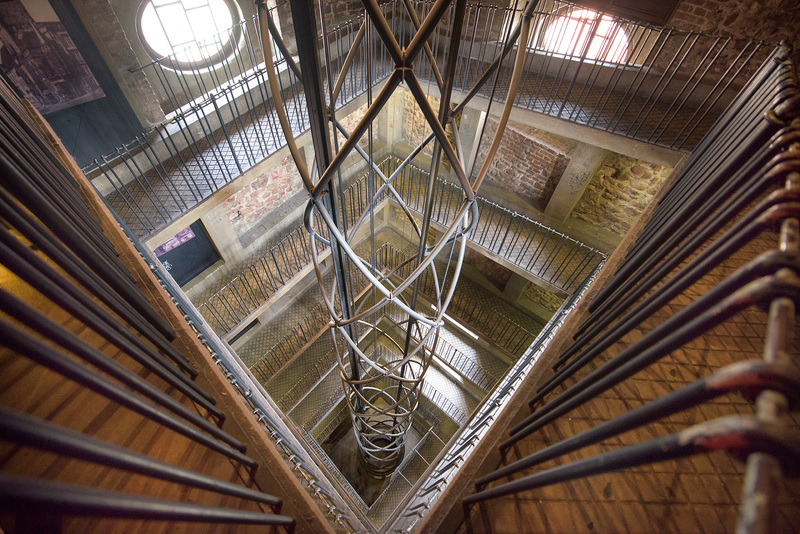 Inside Prague’s Old Town Square Tower they’ve constructed an elegant spiral ramp, with an elevator in the middle. Other than Prague’s TV Tower (I heard one guide call the TV Tower “the second ugliest building in the world,” and it certainly is very ugly and dominates the Prague skyline, for some reason it has grotesque statuary of babies climbing up the circular pillars holding up this hyper-modern structure, don’t ask me why because I haven’t a clue, and I also don’t really know what building is the “first ugliest,” there must be many candidates, but I digress), other than Prague’s TV Tower it is the only high-up viewing spot I’ve found in Prague you don’t have to climb. It certainly is nice riding the elevator in the core to the top, then strolling down the spiral ramp enjoying the somewhat unusual view, shown looking down from the top of the spiral, and from the bottom watching the elevator rise. I found this cabinet containing the Prague Golem at the entrance to Prague’s Old Jewish Cemetery. Fortunately, the cabinet appears locked. I hope it stays that way, at least while I am still in the Czech Republic. Although the single, small padlock may be a little puny to restrain a Golem, such as the famous and notably nasty Golem created according to legend by Rabbi Judah Loew ben Bezalel back in the late 1500s. There are six towers that I know of in Prague to go up with my camera. I’ve been up four out of six so far. Mostly, they are an issue of climbing several hundred narrow steps, but this one—the Old Town Square Tower—has an elevator in addition to a spiral ramp (more on this in a later story). Anyhow, ascending the elevator rather than climbing up left me feeling chirpy. So in contrast to the somewhat somber Spires of Prague I shot this nice, bright canonical city view with my extreme wide-angle Zeiss 15mm f/2.8 lens. Two towers to go! I’ve never seen such a veritable cacophony of spires in a European city as in Prague. These wonderful spires, or towers, help to impart Prague’s unusual and distinctive flavor. What is it about upright towers reaching for the sky that appeals to the engineers among humanity? Wait, hold that thought! This view is photographed from the Powder Tower, which I climbed today. Prague boasts more towers you can climb than is generally the case. Each tower has a circular spiral staircase, seemingly hewn out of the stone. It can be very interesting encountering a party coming the other direction in one of these small, claustrophobia inducing staircases! With Prague’s grand castles and elegant squares overflowing with happy visitors and marquee shopping it is easy to forget that this is also the city of Franz Kafka. Metamorphosis happens here, whether it is a human turning into a bug, or the curved shapes of a nearly empty street altered in the reflection in a traffic mirror. The outer world is unaltered, but inside the metamorphosis the lone pedestrian wanders down a twisted street towards an uncertain end. Getting to Prague from the Bay area took a bit of travel time. I know, less than in covered wagon and sail ship times, but still it was into the next day, and the seat on the airplane was truly lived in. Alas, I made the change of planes in Frankfurt, but my suitcase did not—and flew on with Lufthansa into the unknown. So I arrived on a new day on a Prague afternoon with the clothes on my back and a single camera. Which I took out to explore right away. As I neared the Charles Bridge I saw clouds and maybe a rainbow forming, so I dashed up the spiral stairs in the bridge tower, added a polarizer, and snapped a few frames before my rainbow disappeared. Transparency means something one can look through with clarity, like a sheet of glass or plastic. So what we are interested in is really translucency—the state or condition of being translucent, or partially transparent. But translucency is essentially an optical illusion, or trick of the human eye. When a light color contrasts with a dark color, and the light color is apparently “above” the darker color, then the human eye is trained to perceive degrees of translucency. I am taking a little time to process some of the botanical images I’ve shot so far this year. Soon I will be moving on to photograph the old stones of the old world, but it has truly been fun to have the time this spring to do a great deal of floral photography! Herewith, a few new botanicals. Enjoy! Also note that I’ve opened a 2016 weekend session of my Photographing Flowers for Transparency workshop (March 5-6, 2016, here in Berkeley, California). Click here for details and registration. I am leaving in a few days on the first of my summer teaching adventures: First for Prague in the Czech Republic, and then to teach a Black & White Masterclass in Heidelberg, Germany. Before departing on this trip, I wanted to share some news and give you some workshop updates. Recently, the advance copies of my new book, Achieving Your Potential As a Photographer: A Photographer’s Creative Companion and Workbook arrived. I am very excited and pleased with how my new book has come out, but of course I want to hear what you think once your copy has arrived. 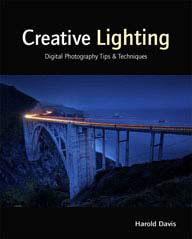 This book and the workbook that comes as part of it are specially designed as an aid to boosting the creativity in your photography (and life) so I would particularly like to know how it may have impacted your ongoing photography. The bulk of the copies are coming on the proverbial boat from China, but it is great news and exciting for us that this project we have labored on so long will finally soon be available on Amazon, at Barnes & Nobles, and other bookstores. Regarding workshops, the April 2016 photo-tour workshop to Southwest France, it is now fully subscribed, but we are taking a waiting list. On the other hand, the autumn 2015 photography adventure to the sea-girt villages of Italy has a few spaces left, and I welcome interest from photographers in this exclusive photo tour. It will be a great photographic experience with a small group of photographers! There is only one spot available in the Flower Photography workshop I will be giving in Maine the first week of August. I don’t expect this opening to remain available for very long, and personally I am looking forward very much to exploring Maine. It is a part of the world I don’t know very well. For 2016, I am taking an interest list for a Photographing Flowers for Transparency workshop in the San Francisco Bay area. Details are yet to be worked out, but you can indicate interest (there is no charge for the interest list) by clicking here to go to Meetup.com. I’ll also be giving a 2016 version of my Achieving Your Potential mentoring workshop (ongoing for six months), you can find information about how to apply for admission by clicking here. Thant’s it for now! Please feel free to contact me for more information about any of these items. I hope to be able to blog from Prague and Heidelberg, time permitting—and as always I look forward to hearing from my photography community. The Yoshino River is one of the three great rivers of Japan. Located on Shikoku Island, it is nicknamed “Shikoku Saburo,” Sabaro being a popular first name for a third son. The photo shows the wide sweep of the Yoshino near its outlet in the ocean near Tokushima. The landscape is actually much more built up than it seems in this image—typical of Japan, most flat areas such as the lower Yoshino Valley are heavily populated. Exposure data: 28mm, circular polarizer, 1/500 of a second at f/8 and ISO 200; hand held, processed in Adobe Camera Raw and Photoshop, and converted to black and white using the “Ansel in the Valley” preset in Perfect B&W. The other day I enjoyed photographing and presenting some local flowers cut from the neighborhood in a fairly traditional way so that the finished images appear at first glance much like old-fashioned botanical gouache paintings with plenty of detail, or maybe color lithographic plates from an old book. The first image is an arrangement of the African Iris Fortnight Lily, Dietes iridioides, which blooms plentifully around here, but only once every two weeks (hence the “fortnight”). The image below is of Nigella Damascena, sometimes called “Love in a Mist,” shown elsewhere on my blog up close and very personal! My new Focal Press book Achieving Your Potential As a Photographer: A Photographer’s Creative Companion and Workbook will be shipping shortly. 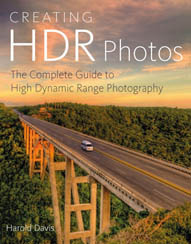 I have a few review copies available to my photographic community. I am looking for honest and thoughtful reviews (hopefully you can say good things about my book and the accompanying workbook!) on Amazon and other venues such as blogs and photography club and user group sites. To apply for a review copy, please send me an email with your shipping address (within the US only please). Include a phone number (it will be used for shipping purposes only). I’d appreciate any information you can supply in your email as to why you’d be a good choice for a reviewer, e.g., previous reviews, and so on. Here’s a book description from the back cover: Achieving Your Potential As a Photographer and the companion Photographer’s Workbook are here to help you be the best photographer that you can be—so you can achieve your potential as a photographer. You’ll find inspiration, ideas, and tools to use along the way, as you achieve new goals with your photography. Harold Davis shows you inspirational examples and challenges you to take your work to the next level, as he guides you along the path to making real progress with your work. The pull-out Photographer’s Workbook that comes with Achieving Your Potential As a Photographer is like a “workshop in a box,” helping you apply what you learn so you can find your unique vision in photography. Thanks for being part of my photography community, I hope to hear from you! What: A week with a small compatible group of photographers in a 15th Century castle in the lush countryside of southwest France in the springtime. Where: Mas de Garrigue, a 15th century fortified farm near the Lot River: gardens, gourmet French home cooking, ancient medieval villages and castles, and a photographer’s and walker’s paradise. When: Thursday April 21, 2016 (leave US April 20) to Friday April 29, 2016 (eight nights and nine days). Group Size: This exclusive, small photo workshop tour is limited to six photographers (non-photographer significant others are also welcome). Details: The group meets at a luxurious hotel in Toulouse in the southwest of France on the afternoon of Thursday April 21, 2016. Toulouse is the fourth largest city in France, and the capital of the modern French aerospace industry. It is easily accessible by plane or train from Paris and other points in Europe. There are many photographic opportunities in Toulouse itself, and we will visit some of these with a private guided tour, followed by an introductory group dinner (included in the cost). On Friday April 22 we will transfer by private mini-bus to Mas de Garrigue in Calvignac on the banks of the beautiful Lot River. This is a region of beautiful rivers and valleys, stark cliffs with ancient clinging villages, sacred pilgrimage routes, stone bridges, churches that date from the era of the crusaders, beautiful flowering gardens, and much more. The Mas de Garrigue will be our home away from home for the next seven nights, hosted by Sarah and Steven. Here’s a description: “Mas de Garrigue, a 15th century former hunting lodge and fortified farm is a stunning and important historic house retaining many original features within such as vast stone fireplaces, arrowslits, a 15th century window, stone sinks, magnificent oak beams and pigeon coops. Sarah and Steven have lovingly and respectfully restored the house, with elegant taste and sometimes a contemporary twist. The marriage of Irish antiques and art with French architecture is harmonious and charming. While at the Mas de Garrigue Sarah and Steven will provide us with three wonderful dinners and a number of box lunches (these are included in the tour cost). We could happily spend our time photographing right around the location of the Mas de Garrigue (and if you choose to do so, no one will think the less of you! ), but three extensive professionally-guided excursions are included in the workshop. St Cirq-La-Popie, widely considered one of the most scenic villages in France, and the pre-historic caves of Pech Merle. Pont Valentre, famous from the 100 Years War, and the old town of Cahors, Chateau Biron, and the historic “bastide” town of Monpazier. The ancient pilgrimage citadel of Rocamandour, and (time permitting) the Dordogne Valley. When (alas!) our time in the Lot River Valley draws to a close on Friday April 29, transfer by private mini-bus to Toulouse train station or airport for return to the United States or further adventures in Europe is included. Cost: $4,695 per person (single supplement $675); $500 early-bird discount for completed registration by August 31, 2015. Inclusions: Eight nights lodging (one night at a 4-star hotel in Toulouse, seven nights at Mas de Garrigue), all breakfasts (8), many meals (four dinners, four lunches), walking tour of Toulouse with licensed guide, transfers from Toulouse to Mas de Garrigue (Calvignac) on arrival, and from Calvignac to Toulouse returning, three extensive excursions including admissions and licensed guides, and service charges. Exclusions: Airfare and transportation to Toulouse (Toulouse is easy to reach by plane or train from Paris and many other points in Europe), meals except as indicated, wine and spirits, and personal items such as souvenirs. To Register: Please send us an email expressing interest right away; a completed registration requires a $1000 deposit. I snapped an iPhone photo, and processed it while the kids played in the rocks. Then today I couldn’t resist going back with the big camera! Processed, like my Agaves, to look as much like an etching or a lithograph as a photo.